MASERU – It not every day that you see women come together for a great course. This is, however, not the case for Palesa Mokhethi, Rethabile Ntereke Mofoka and Siziwe Mpopo, three women who call themselves Women Of the Well (WOW). Women of the Well is a performing arts group mainly focused on poetry. The trio began reciting poems in 2006, using this form of art as a tool for advocacy and storytelling. The idea behind the name was inspired by a dream the members had to create a space where women from all walks of life could come together to share, build and nurture as well as use poetry to inspire and heal. WOW was established in an attempt to bridge the gap of communication between women and the community as a whole with regards to societal issues that women and children face. 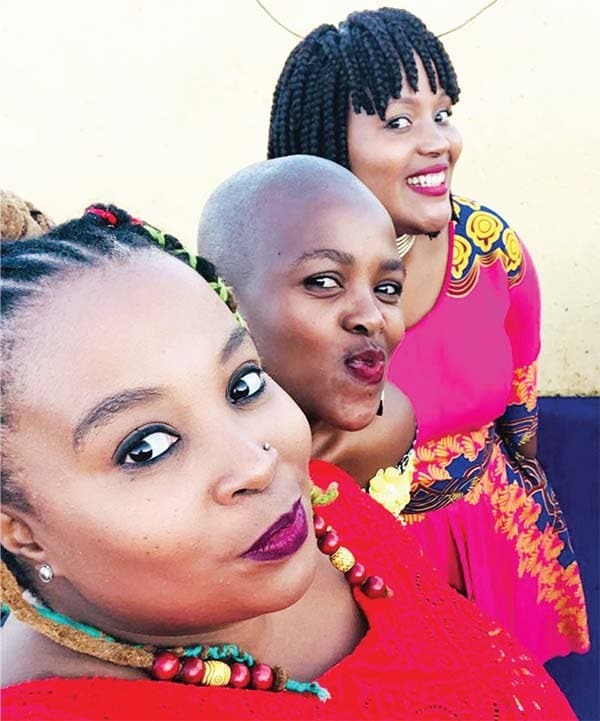 The three indicate that they are women with a passion for poetry as a powerful, artistic and entertaining mode of conveying messages of healing and empowerment. “Initially we thought we were merely wordsmiths. We would spend endless days creating rhymes, skims and metaphors, enticed by the freedom we unearthed in poetry. “It was not just an escape; it became our identity, our first love. We would stand before our audiences and pour our hearts out, spitting stanzas infused with the truth of our innocence and the inherent wisdom we had stumbled upon in our youth,” they say. The whole thing started at St Catherine’s High School and the group thinks that perhaps the fact that the school was an all-girls high school made it easier for them to stand before the masses, without worrying about preying eyes. Looking back now, they say, they are amazed at how much attention their fellow schoolmates gave them. “Some would learn our lines and recite along with us. When we wrote our first song ‘You wine, you lose’. It became what we considered at the time a class anthem. This culture to create and share, enabled us to write the most amazing poems, some of which have become renowned. For Siziwe it was SHE, for Palesa the illusion and Lay your foot for Rethabile,” they say. The three further indicate that WOW was birthed by a terrific incident one of them had heard about. One of them had heard a story of a young girl who had been repeatedly raped by her employer and when she reported the incident to elderly women, she was asked to keep it concealed, lest she tainted the man’s name. This then put a heavy burden in their hearts. They say they could not give it a name, but they knew it was injustice and as young as they were, they thought there must be something that must be done. “We began with what we had and what we had was poetry, the power of expression, a voice. We then thought to create a space where women from all walks of life would come together to share ideas, experiences, lessons and dreams. “A space for healing and growth, where one would be their true authentic self, free of the fear of judgment,” WOW says. The three describe themselves as a collective of likeminded artistes with zeal to carry in their performances messages of hope and change. They say one could say they have taken an oath to be the voice for the voiceless through telling stories of their own and shedding light through artistic expression on pressing social issues. They maintain that this was only an idea until they re-united at NUL to create their very first piece, ‘African Woman’- a praise poem for African women defining their power to rise against adversity and thrive despite the challenges they are confronted with daily. For them, the poem made a clear statement of their mandate to tell positive stories of women. This very poem helped make way for the group to break new ground in spaces where art, let alone poetry would never have been heard. They emphasise that they performed for delegates and great leaders and took part in national strategies, policy reform processes, launches and campaigns. They also performed in 2008 at the Gender and Media Southern Africa (Gemsa) campaign advocating for 365 days of activism against gender-based violence held in partnership with the Ministry of Gender and Youth, Sports and Recreation. In 2009 they performed at the ‘One Love, One Partner campaign’ under the United States President’s Emergency Plan for Aids relief held at Lehakoe in partnership with PHELA and in 2009 they performed at the Mantsopa Festival held in Maseru. They also performed at the ‘Red Light against Human Trafficking campaign’ hosted by Women In Law in Southern Africa (WiLSA) held at Maseru Club. The following year and in 2011 they hosted ‘Valley Breeze’, a poetry show in partnership with Poetry Farm at the National University of Lesotho where they had South African poet, Afurakan, as a guest performer. The group also performed at the 10th year anniversary Celebration of Population Services International Lesotho (PSI/L) held at Thaba Bosiu and in 2017 performed at Rebel Sister Cypher Khayelitsha, Cape Town and at the Alliance Sports Media Awards, again in 2017. Last year they performed at Rets Food Tasting and Cocktail Garden Party, Mother Daughter Dialogue, and Nala Social Market while they performed at Tiny Art Gallery Morija and many other places. The group indicates that WOW also existed within a network of artistes where many great partnerships were forged, which presented an ample chance to perform locally and abroad. “Time took its toll on us, life played its deceptive games on us and for a while we lost sight of the goal which fueled our passion. “We left poetry’s in pursuit of mirages that we were never able to grab hold of. Time passed, lessons were learnt and in the end the dream continued to own us. Till paths were cleared and we made our way back to the well, back to each other, back to poetry, our home,” they say. WOW’s vision is to deal with women-related issues such as women empowerment, health, and politics throughout the whole spectrum and they also want to work for matters of advocacy using arts. Their view regarding the entertainment industry in Lesotho is that it does exist because there is raw talent and that all that has to be done is for artistes to treat their art professionally so that people could start to take them seriously. “It is not something that is going to happen overnight but it is all about coming together and creating conducive space and finding where there is a gap for the arts to come in and make a difference,” they say.